Racers Guild is a West Midlands based club with a focus on Downhill MTB who organise downhill races and events at Stile Cop, Cannock Chase. The event took place on 21st February there were 112 riders competing with 8 in the women’s category. Here’s Kate’s race report. After a cracking day being coached and conquering my fears to hit some larger drops, I was returning back to Stile Cop for the second race of the Racers Guild Winter Classics at Cannock Chase. The track to be raced was Wonderland over on the dark side of the hill. I just so happened to park right next to my team mate Rebecca again who was modelling her brand spanking new DHaRCO kit and was rather excited to say the least! We headed off for a track walk and to look at possible lines we could take. Wonderland is a steep weaving track at the top tha’s rather tight, techy and rooty. The first tight corner has two options which were both steep and tricky, the slightly wider smoother line over some shiny looking roots or the rocks on the inside. There’s a tree right on the exit making the end of the turn really sharp. The smoothest option is to take the roots on the outside as this softens the turn and steadies you for the step down that’s awaiting straight after passing the tree. I would normally have gone for the rocks which I know I will be OK with, but I decided to have a bash at taking the riskier, yet more flowing line on the outside. The track continues to zig zag with another steep step down, followed by a wheel lift over some exposed roots – I went for the high line on the roots rather than taking the safer slower line at the bottom of them. After more twisting the last tight bend spits you out down a steep chute which was proving to be a bit slippy and boggy. You needed to keep off the brakes here and carry that speed over a mass of roots as the track starts to level out, Speed is your friend!! Again, I went for the high line and over the thicker roots – you needed to hit this line quickly after the chute to avoid the roots facing the wrong way which was quite testing! As the track levels out it’s all systems go skimming past trees, popping over two small jumps down into more roots and a tight bend to the final drop off and the finish line. A few practice runs down and I wasn’t flowing as nice in the top section as I would have liked but I was sticking to my lines and taking the challenge on. For me this is the hardest track I’ve come across so far, with a very strong competitive field, so I know I had my work cut out but was looking forward to my race run down. My name was called and I lined up ready with the rest of the girls. After lots of words of encouragement from the gang I set off on my run. I was very hesitant into the first tight corner and down the roots which is what I feared but I made it through – I still couldn’t get my run to flow through the top section and felt very sketchy until I let off the brakes and went for it into the fast chute and over the roots un-weighting, pumping and adding pedal strokes where I could – now that put a grin on my face! As I expected, I was off pace compared to the rest of the girls on both my race runs although I did knock off some time on my second run. There was some really rapid times recorded in our group and I see this as a good challenge being up against such skilled fast riders. All of the girls willing to help and give advice which is great. Although it was a disappointing result for me personally, I will be going back to Wonderland to help improve my technical riding – I’m already itching to get back and keep going at it as I know it will only make me a better rider as much as I struggled with certain sections, I have a burning desire to conquer them! Big thanks to the organisers Mark Whyte (even though he’s nicknamed me toilet Kate :), Harry Clark and the rest of the team for a fantastic event again and thanks to Prospect Visuals for capturing my determined race face in style. 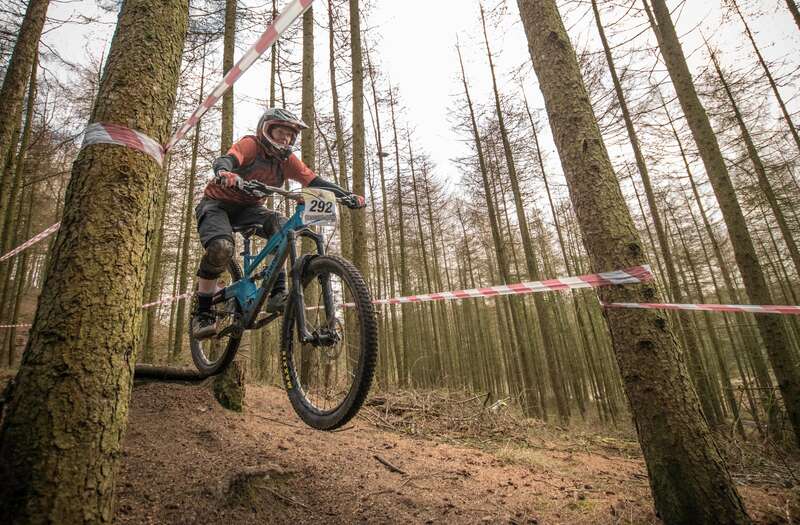 Really looking forward to meeting up with the race girls and my Flow team mates at the Forest of Dean Mini Downhill this coming weekend. Happy shredding everyone!